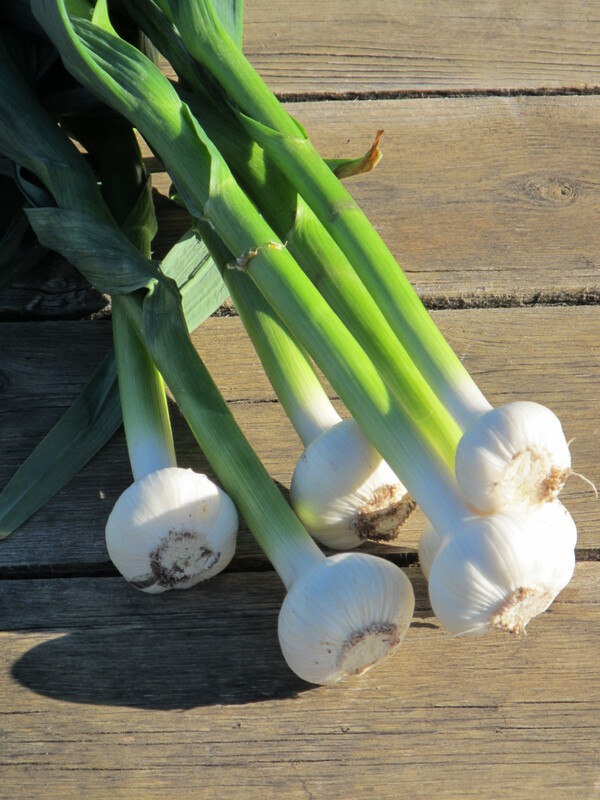 Green garlic is a fresh eating herb and has not been cured for winter storage. It should last for up to two weeks stored in a crisper, be sure to cut off the green tops first. 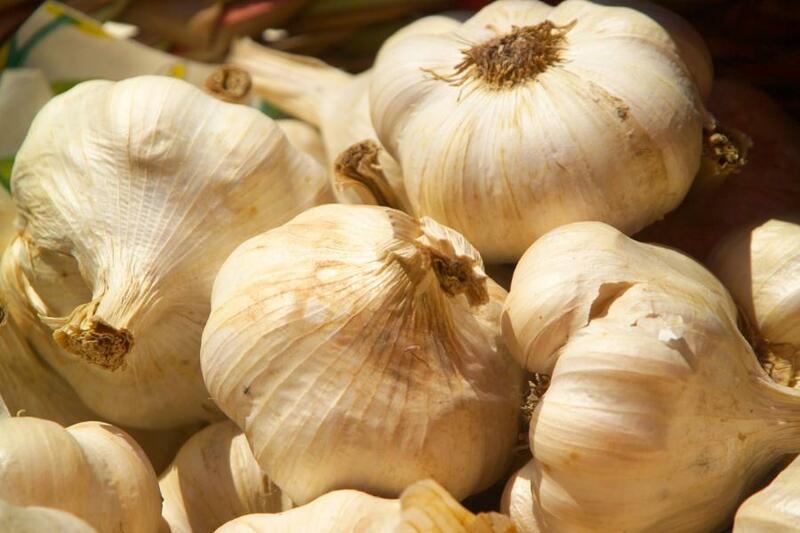 Fresh garlic is milder than mature cloves so feel free to use a healthy dose in cooking. Fresh garlic is also easy to peel. Cut off the dried core end of the clove and using the tip of a knife, lift up the skin to remove. Garlic scapes are the flower top off hardneck garlic. They look like a long green, curly pencil. The entire scape is edible, but there can be a tough section at the base of the yellowish-white blossom that could use more cooking time. The green stems are most commonly cut into small pieces and cooked. 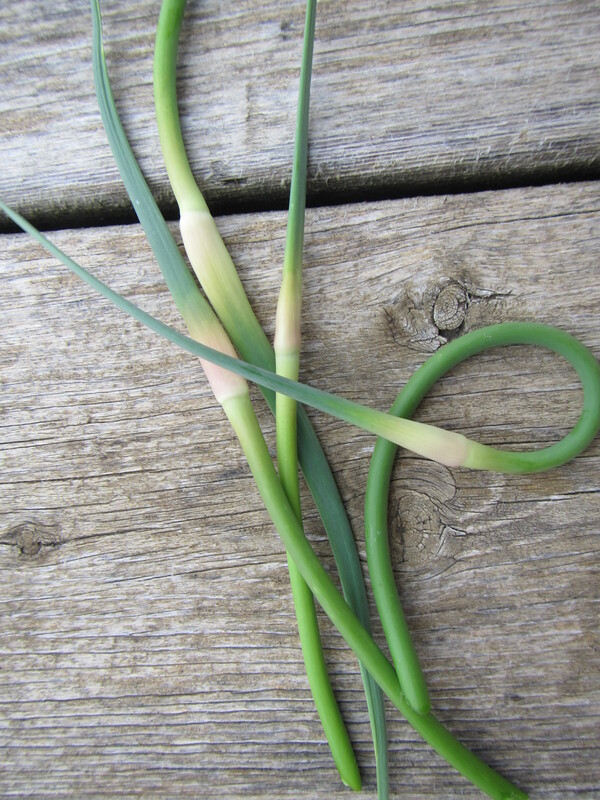 Scapes are cut before the plant starts to fully flower, and provide a mild fresh garlic flavor that is great added to any dish where you would use a garlic clove. The sugar content is a bit higher so fresh scapes are best added towards the end of cooking to avoid any burning or bitter flavor. The scapes need to be stored in a plastic bag in the refrigerator and are best used fresh since they do not store like whole garlic bulbs. Garlic scapes are mild in flavor so you can add extra when substituting for garlic cloves. They are a great addition to breakfast scrambles and stir fries. What is a meal without garlic? Used in many traditional cuisines garlic adds complexity and flavor to many popular dishes. Cured garlic will last through the winter if stored in a dry and fairly cool location. If you notice a bulb starting to soften, use it first.